A stupendous amount of heat is shifted by ocean-surface currents, so they have a major influence over regional climates. But they are just part of ocean circulation systems, the other being the movement of water in the deep ocean basins. One driver of this world-encompassing system is water density; a function of its temperature and salinity. Cold saline water forming at the surface tends to sink, the volume that does being replaced by surface flow towards the site of sinking: effectively, cold downwellings ‘drag’ major surface currents along. This is especially striking in the North Atlantic where sinking cold brines are focused in narrow zones between Canada and Greenland and between Greenland and Iceland. From there the cold water flows southwards towards the South Atlantic at depths between 1 and 5 km. 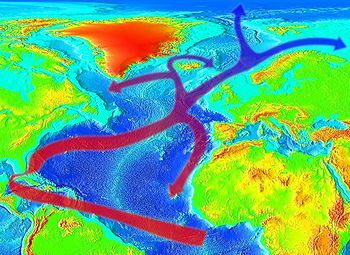 The northward compensating surface flow, largely from tropical seas of the Caribbean, is the Gulf Stream/North Atlantic Current whose warming influence on climate of western and north-western Europe extends into the Arctic Ocean. 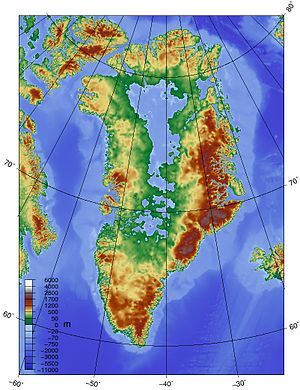 Since the discovery of this top-to-bottom ‘conveyor system’ of ocean circulation oceanographers and climatologists have suspected that sudden climate shifts around the North Atlantic, such as the millennial Dansgaard-Oeschger events recorded in the Greenland ice cores, may have been forced by circulation changes. The return to almost full glacial conditions during the Younger Dryas, while global climate was warming towards the interglacial conditions of the Holocene and present day, has been attributed to huge volumes of meltwater from the North American ice sheet entering the North Atlantic. By reducing surface salinity and density the deluge slowed or shut down the ‘conveyor’ for over a thousand years, thereby drastically cooling regional climate. Such drastic and potentially devastating events for humans in the region seem not to have occurred during the 11.5 thousand years since the end of the Younger Dryas. Yet their suspected cause, increased freshwater influx into the North Atlantic, continues with melting of the Greenland ice cap and reduction of the permanent sea-ice cover of the Arctic Ocean, particularly accelerated by global warming. The Holocene interglacial has not yet come to completion, so checking what could happen in the North Atlantic region depends on studying previous interglacials, especially the previous one – the Eemian – from 130 to 114 ka. Unfortunately the high-resolution climate records from Greenland ice cores do not extend that far back. On top of that, more lengthy sea-floor sediment cores rarely have the time resolution to show detailed records, unless, that is, sediment accumulated quickly on the deep sea bed. One place that seems to have happened is just south of Greenland. 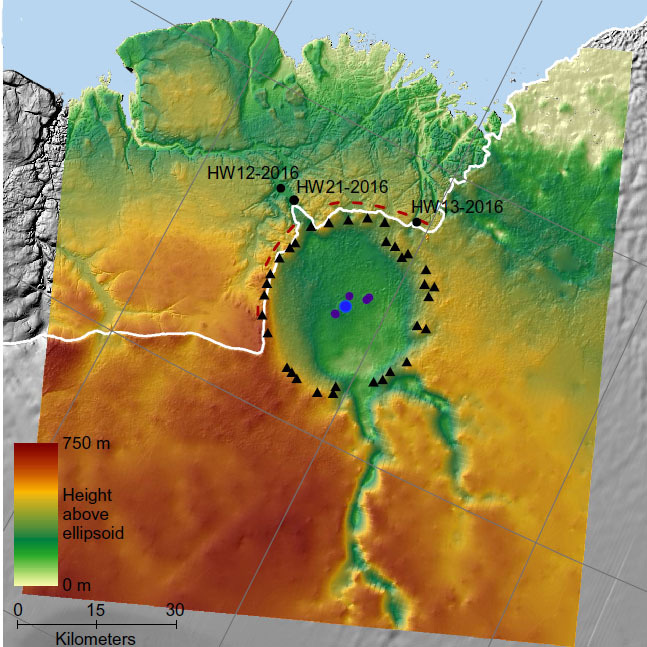 Cores from there have been re-examined with an eye to charting the change in deep water temperature from unusually thick sediment sequences spanning the Eemian interglacial (Galaasen, E.V. and 7 others 2014. Rapid reductions in North Atlantic Deep Water during the peak of the last interglacial period. Science, v. 343, 1129-1132). The approach taken by the consortium of scientiosts from Norway, the US, France and Britain was to analyse the carbon-isotope composition of the shells of foraminifers that lived in the very cold water of the ocean floor during the Eemian. The ratio of 13C to 12C, expressed as δ13C, fluctuates according to the isotopic composition of the water in which the forams lived. What show up in the 130-114 ka period are several major but short-lived falls in δ13C from the general level of what would then have been North Atlantic Deep Water (NADW). It seems that five times during the Eemian the flow of NADW slowed and perhaps stopped for periods of the order of a few hundred years. If so, then the warming influence of the Gulf Stream and North Atlantic Current would inevitably have waned through the same intervals. Confirmation of that comes from records of surface dwelling forams. This revelation should come as a warning: if purely natural shifts in currents and climate were able to perturb what had been assumed previously to be stable conditions during the last interglacial, what might anthropogenic warming do in the next century? Did major ice-age climate changes across Europe take at the same time?